Schools use the sports premium funding to improve the quality of the PE and sport activities they offer their pupils, but they are free to choose the best way of using the money. 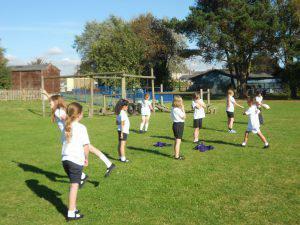 The funding of PE and outdoor activities has been doubled to £17,600 for this academic year. This money has been used to enter into the Shepway Sports Trust partnership, which has given all staff access to specialist PE teachers. These specialist PE teachers supports our teachers leading PE and games lessons, not only upskilling teachers but also our children. They run and support a large programme of extra-curricular PE activities including football, hockey, gym, netball, dance and multi skills. Shepway Sports Trust also ensures sporting activities are available for children on the playground at lunch and break times – these include volleyball, football, tennis, cricket, climbing activities and skipping. The Shepway Sports Trust partnership programme allows Palmarsh Primary school to take part in a large selection of district and county sporting competitions, where children are able to develop their skills to elite levels or just to take part in an event for fun. Large numbers of children have had the opportunity to take part in a variety of events and our successes in competitions have shown how this funding has influenced the health, skills and well-being of the children at Palmarsh Primary School. Also we have the opportunities for the children to meet ambassadors to inspire and promote sports and healthy living. Alongside this, the school has invested some of this funding into Outdoor Games and Activities such as Orienteering and Forest School. This will lend across the entire curriculum providing our children with a wide range of opportunities to learn new and exciting skills. We currently take all Key Stage 2 children swimming for two half term blocks each year. Swimming is an essential part our our P.E. curriculum at Palmarsh and we aim to get every child swimming over a 2 year period, but it is strongly advised and one that we as a school greatly encourage. We currently ask for a voluntary contribution of £4.00 each week to cover transport and entrance costs. A letter will be issued to parents/carers prior to children starting swimming lessons.